The December issue of the Bulletin has now been published and is available. 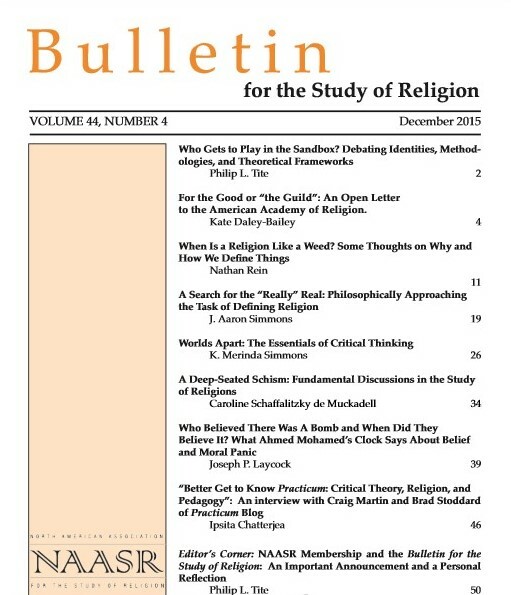 Below is the table of contents of this issue, which includes an Open Letter to the AAR on the challenges facing adjunct/contingent faculty with regard to the annual meeting, a set of papers responding to Caroline Schaffalitzky de Muckadell’s provocative JAAR article on essentialist definitions of religion (published in 2014), along with an article by Joseph Laycock analyzing the controversy in a high school in Texas over Ahmed Mohamed’s clock, a clock which was treated as a bomb threat by school officials. We also include an interview with the editors of the Practicum blog and an “Editor’s Corner” reflecting on the new subscription arrangement between the Bulletin and members of the North American Association for the Study of Religion (NAASR). As always, we welcome submissions for future issues – including responses to published articles – from established scholars and graduate students engaged in the study of religion (regardless of discipline) for either publication in the Bulletin or for here on the Bulletin’s blog. Our guidelines for the journal are available online. This entry was posted in Announcements, Brad Stoddard, Craig Martin, Editorial, Interviews, Ipsita Chatterjea, Joseph Laycock, Kate Daley-Bailey, Nathan Rein, Pedagogy, Philip L. Tite, Politics and Religion, Religion and Society, Religion and Theory, Religion in the News, Theory and Method, Theory in the Real World and tagged AAR, Ahmed Mohamed, American Academy of Religion, american religion, and Pedagogy, Belief, Bulletin for the Study of Religion, Caroline Schaffalitzky de Muckadell, Craig Martin, critical thinking, Definitions of Religion, Essentialism, functionalism, Ipsita Chatterjea, J. Aaron Simmons, Joseph P. Laycock, K. Merinda Simmons, NAASR, Nathan Rein, North American Association for the Study of Religion, pedagogy, Practicum: Critical Theory, Religion, religious studies, scholarship, teaching. Bookmark the permalink.